Now more than ever, interruptions, clinical errors and healthcare communication solutions are a part of hospital work life. 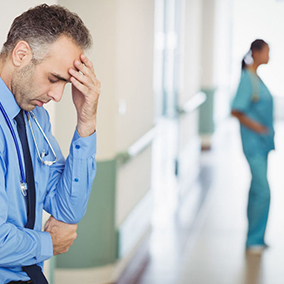 In fact, a report in the Journal of Informatics in Health and Biomedicine indicated that hospital doctors and nurses are interrupted up to 23 times per hour in emergency, intensive care, and surgery situations – which can directly affect decision-making and patient safety. Interruptions to nurses administering medications are associated with a 12% increase in procedural failure and a 13% increase in clinical errors.1 The I.T. function is not immune to this phenomenon either. That means that controlling interruptions is not just mission critical – it is life critical. So how does one prevent medical errors from occurring? Change the interruption-laden culture of your healthcare organization. Easier said than done, right? However, CIOs and senior department leadership can lead the way. Adopting a single workflow-driven communication platform allows CIOs to transform the interruption culture – while reducing errors, redundancies, and staff dissatisfaction. In response to this concern, PatientSafe has developed the How I.T. Can Curb Staff Interruptions tip sheet to support your healthcare communication solutions initiatives. This 5-page data sheet defines what clinicians need as the standard for a smarter healthcare communication solution: a communication platform that works the way they do. To see how PatientTouch reduces interruptions and unnecessary tasks, request a demo with us.